Crimzon Clover is originally a doujin PC game released in 2011 during the 79th Comiket. 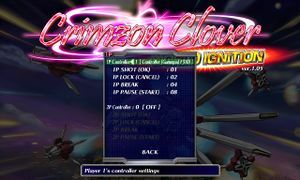 An enhanced arcade port of Crimzon Clover was released in 2013 previously exclusive to NESiCAxLive. 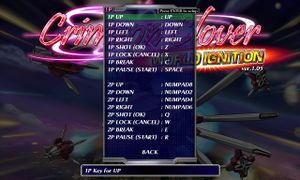 World Ignition is based on the updated arcade version. Printable, high-quality posters and flyers from the game. 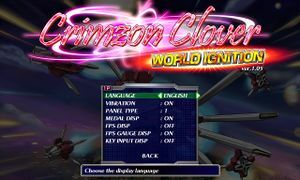 Adds an arranged sountrack by Gryzor87 that can be played in Crimzon Clover: World Ignition. 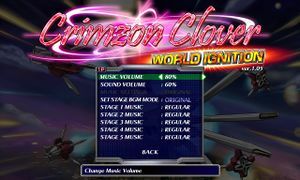 Original soundtrack for Crimzon Clover: World Ignition. Adds a collection of expert replays from various players across different skill levels and ship types in the game. Also includes an in-depth strategy guide with commentary for each replay. All DLCs are currently available only for Steam. keyboardSetting.dat stores key remapping settings. arcadescore000X.dat and novicescore000X.dat holds high-score data for Arcade and Novice modes, respectively. lastEntryLocalName.dat stores previously used name entered for high-scores. Game outputs at 1280x768 for widescreen. v1.02 adds the ability to stretch the game screen when fullscreen resolution is higher than 1280x768. Nearest neighbor and bilinear scaling can be used in fullscreen when stretching the game screen. The game was intended to be played on a vertical monitor, the sides are mostly filler with some gameplay information being displayed. Options are available to rotate the game screen 90° left or right when the monitor is turned on its side (recommended primarily for displays designed and built with this in mind). Prior to v1.02, a pop-up window would ask you to launch the game in windowed or fullscreen, breaking full controller support. No dialogue is in this game. ↑ 1.0 1.1 1.2 1.3 1.4 1.5 When running this game without Administrator elevation, activity in %PROGRAMFILES%, %PROGRAMFILES(X86)%, and %WINDIR% might be redirected to %LOCALAPPDATA%\VirtualStore\ (more details). ↑ 2.0 2.1 File/folder structure within this directory reflects the path(s) listed for Windows and/or Steam game data (use Wine regedit to access Windows registry paths). Games with Steam Cloud support may store data in ~/.steam/steam/userdata/<user-id>/285440/ in addition to or instead of this directory. The app ID (285440) may differ in some cases. Treat backslashes as forward slashes. See the glossary page for details. This page was last edited on 14 December 2018, at 09:18.